Which Color Will Suit Your Style? Here at Window World of Dallas, we believe your home should be a reflection of your personality. Every last square foot of your space, from the roof to the floors, should complement your tastes in design, style and color. Our number one priority is to cater to your needs. Whether you come to us for help reducing your energy bills or to improve the overall appearance of your home, we will guide you through every step of the process. We genuinely enjoy working with our customers to find products that suit their tastes. Fortunately, when it comes to the color of your vinyl siding, the choices are nearly endless. Picture your home draped in rich hues such as our Autumn Red or our Deep Moss. Imagine a home fit to sit by the sea with charming colors of Harbor Blue or Cape Cod Gray. Or, for the more traditional homeowner, envision your home coated in clean, crisp tints like Glacier White or Natural Linen. Want to try it before you buy it? While we can’t let you actually test run your new vinyl siding, we can let you create the appearance of your home virtually! Our virtual design center gives you the opportunity to experiment with vinyl siding styles and colors, along with accents, such as trim color, roof color and door color. 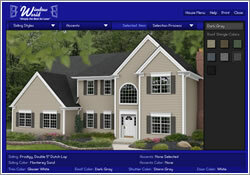 Try out our vinyl siding design showcase here! 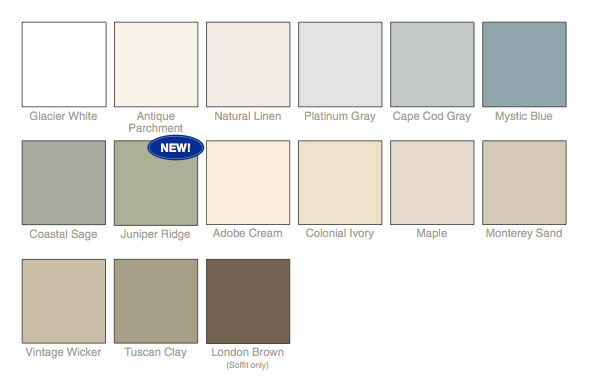 Are you ready to choose the vinyl siding color that is right for your Dallas home? Contact the experienced professionals at Window World of Dallas – Fort Worth for your free in-home estimate today!